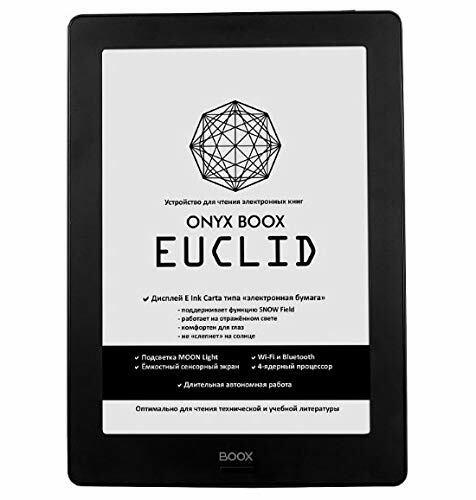 Yesterday I posted about a couple of new Onyx ereaders on Amazon that you probably should avoid buying, but there’s another model called the Onyx Boox Euclid that may be worth considering. It’s basically a Russian version of the Onyx Boox Note S except it adds a frontlight, which is something none of the other Note models offer and is one of the biggest complaints about them. However, the Euclid doesn’t support note-taking using a stylus; it only supports capacitive touch. But otherwise it has the same hardware as the Note S, with a quad-core 1.6GHz processor, 1GB of RAM and 16GB of storage space. These models have the low-resolution E Ink screens (1200 x 825) so that’s why they’re a lot cheaper than the 10.3-inch models. The operating system is based on Android 6.0, but according to the one review the software is a bit different than on the regular Note devices, more limited in functions. The Onyx Boox Euclid is priced at $379 on Amazon and is being sold by Ectaco. That’s $10 higher than the Note S so the markup isn’t as high as Ectaco’s other Onyx ereaders, some of which are insanely overpriced. My experience with the Onyx Boox Note S wasn’t great so I wouldn’t recommend the Euclid under normal circumstances, but considering it’s the only option for a 10-inch E Ink ebook reader with a frontlight it’s worth mentioning. The upcoming Likebook Mimas will be a better option when it gets released, but the price with probably be around $100 higher, at least. Yes. I am waiting for boyue likebook mimas. I consider too boyue likebook note too. Mimas and likebook note get 10,3″, both. And 9,3″ the Onyx boox note s, that you mentioned. Thank you for your information. Disappointing no microSD for a Android e-reader. Waiting for boyue likebook mimas. Unfortunately Onyx has done away with page buttons and memory card slots on their newer models, a very questionable decision. I’d trade their flush glass screens for page buttons any day.